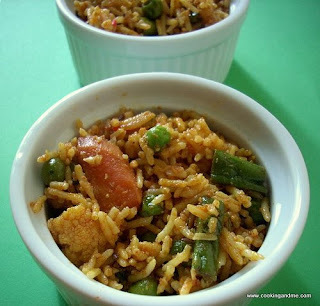 Discription:It is very easy vegetable biryani recipes.Try it and Enjoy!! Wash and soak rice for about 15 mins. Cook in an open pot with 3 cups water until the rice is cooked yet firm. Alternately, you can pressure cook for one whistle with one cup water. Grind the ingredients for spice paste adding very little water. Meanwhile, cook the chopped vegetables in adequate water until cooked yet firm. Heat oil/ghee and roast the fennel seeds, cardamom, cloves and bay leaf for about 30 seconds. Then add the onions and fry till it turns pink and translucent. Add the semi cooked vegetables next and saute for 2-3 mins. Mix in the ground spice paste and fry till the raw smells leaves it. This shouldn't take more than 5 mins. Next add the curd (if using), red chilli powder, turmeric powder, lime juice and salt and mix well. Turn off the heat. Add the cooked rice and mix gently until well blended.